Like most people, when it comes to spending my hard earned cash, I like a bargain. And when it comes to makeup and products I generally like to trial them first, and Benefit's gift sets tick both boxes for me. They are much better than the Benefit Christmas calendar in that you get a lot more product for your money but you also aren't shelling out for a full size product, and you get to try a few different products in one gift box. 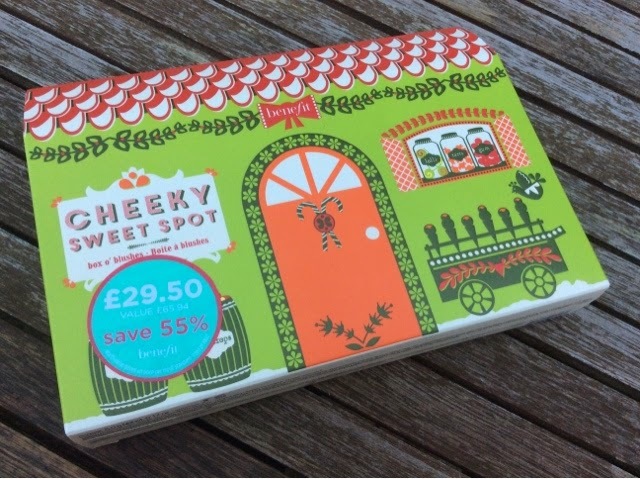 I have two of the gift boxes, Sweet Tintations and Cheeky Sweet Spot. These are Christmas 2014 gift boxes and I think I got one of them from Boots and one from Debenhams. Watch out for 10% of at Debenhams (blue cross sales etc) and watch out for points deals at Boots, we need to be savvy about shopping if we are going to get a bargain. 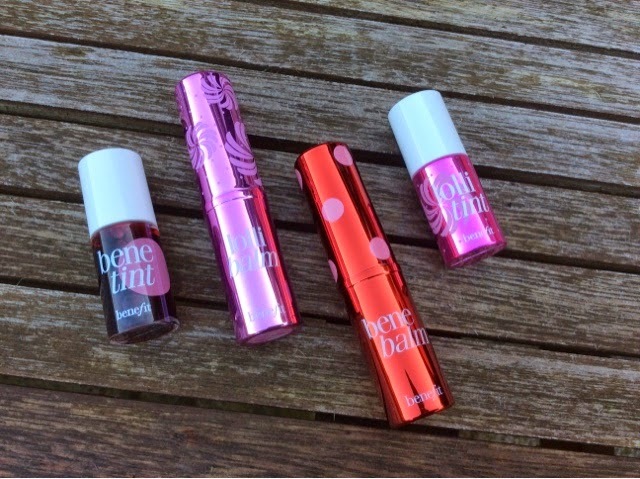 12.5ml Bene/Lollitint full size % 4ml gift set Bene/Lollitint = 3.125 which we will round down to 3. So you get a third of the product in the gift sets, so we need to find a third of the price. So if you were to pay full price for these products you would pay £45.32 and instead you are only paying £19.50 which is a saving of £25.82! A bargain? I think so! This gift set has 4 cheek colours, 1 cheek and face powder, 1 bronzer, 1 hi-lighter and 1 little tiny brush. Basically everything you will ever need for your cheeks. I bought this gift set because I had already purchased the Rockateur blusher and I am in love with it. So much so that I wanted to try some of the other blushers, but at £23.50 a pop i couldn't justify/couldn't afford to buy all that I wanted. Then I spotted this tin of goodness and all my dreams came true. This retails at £29.50. Dandelion - light pink face powder that can be used on cheeks as a light blush (which is how I will be using it), or over the full face for a touch of colour (which I have not done yet, so I don't know how that would look). Bella Bamba - '3D watermelon' blusher with gold undertones. Sugarbomb - 4 blusher shades in one, peach, soft plum, pink and rose. Swirl them all together like a shimmer brick and dust on your cheeks. Hoola - Number 1 selling brozer in the UK apparently. CORAlista - coral pink blusher. Rockateur - rose gold blusher. Watt's up! - champagne cream to powder hi-lighter. Lets have a look at the costing. The full size blushers and the bronzer all cost £23.50 each and Watt's up! is £24.50. The full size powders have between 5-8g of product in them. The Watt's up! has 9.4g. So this gift set retailing at £29.50 is bargainus in the extreme! I seriously love these gift sets. 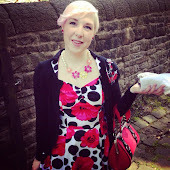 They are such good value for money and they are TOO CUTE! I mean just look at them. If you are a Benefit fanatic or if you want to give Benefit a try these gift sets are the way forward, too good to pass up I would say. 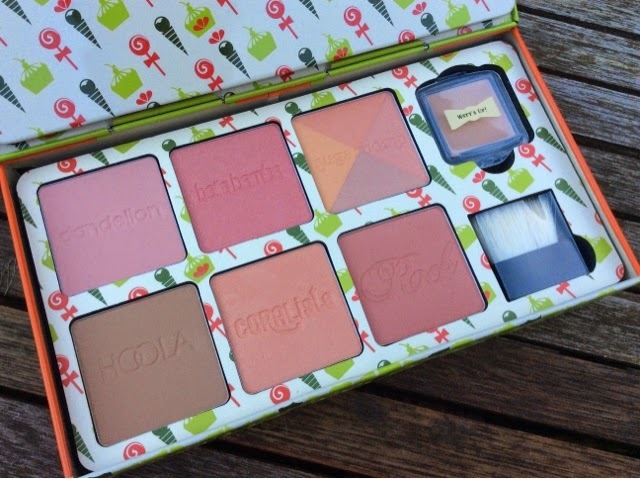 Benefit do gift sets all year round and even more when it comes to that festive time of year. I cant say they will definitely have these specific ones in next Christmas but hopefully Benefit will have something equally as amazing! How do you guys feel about gift sets? Are they value for money or not?